and to our neighbors, which is everyone else. Members of Ebenezer reach out to each other when one of our family is hurting, in need of financial assistance or just a word of encouragement. We are also involved in helping people who are not a part of Ebenezer's official family, both locally and around the world. The Sunday school classes, our youth groups, and other groups band together to provide aid to individuals here and in other cities, states, and countries. Below is a list of some of our helping ministries. You can also search through the Ministries pages for more information on what other Ebenezer groups are doing to share the love of Christ. Ebenezer’s United Methodist Women’s group started the Prayer Shawl Ministry in October 2006. Several of the members knit the shawls and lap robes used in the ministry. These items are prayed over by the women, and then given to shut-ins, the sick or those recovering from surgery or other medical conditions, new born babies, our service men and women, and our high school graduates each May (made in their school colors). We have also sent some to Costa Rica and Bolivia with mission teams. In four years, the women have made and distributed 127 shawls or lap robes to church members and non-members as their way of showing Christ’s love and our concern for the recipients of these special gifts. Every year, Ebenezer UMC cooks up a huge amount of pork over a hickory smoke fire, and sells it with a delicious tomato-based barbecue sauce. Funds raised from this annual sale of barbecue plates with slaw, baked beans, and a roll are given to one or two people in the community who are in need. For instance, many of the recipients use the money to help pay on medical bills. We prepare the meat at the church, selling the plates to businesses and other groups on Friday afternoon at lunchtime. We deliver orders of 10 or more plates. We continue the sale through Friday evening and Saturday lunch and dinner hours with eat-in or take-out available to all. This is Ebenezer UMC’s biggest and most popular fundraiser of the year. Our members prepare some excellent home-made desserts to go with the meal, and we serve the food up with welcoming smiles and loving hands. Check our Calendar or the News page for the next one. You can help someone in need and get a great meal to enjoy, too! Mission Statement: To share God’s love by humbling ourselves and by becoming a means through which God can provide for people. 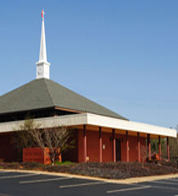 In 2009, Ebenezer UMC began The Lord’s Supper Ministry that delivers hot meals to people in need within our community (Dudley Shoals and southern Caldwell County). We began with meals for 22 people, and have served up to 52 people at a time. Along with these meals, small pieces of agape are included. These are small tokens of the love that fuels our ministry, and more importantly, that God has for our neighbors. We want to share this love with people that are sick, lonely, or just plain busy. Our hope is to address people’s physical needs so that those needs do not become a stumbling block to their experiencing God’s love. Please pray for this ministry and the expansion of our food pantry ministry, as we accept God’s call to love one another as He has loved us. Your donations of food and funds are greatly appreciated. Contact the church office for further information or to volunteer to help. Although Ebenezer UMC has had a small food pantry service for several years, we plan to expand this service. We give items and money to South Caldwell Christian Ministries, but economic conditions have caused many more people to be in need of extra help. We hope to be able to partner with other organizations and become involved with the School Backpack program in the future, which provides backpacks of food items for needy children to take home every Friday to ensure that they get nutritional meals over the weekends. Other groups within Ebenezer UMC also collect canned goods and other items to distribute to those in need. For instance, the youth of the church went trick or treating for canned goods two years in a row. Instead of asking for candy, they asked for donations of canned goods to be given to those in need. Ebenezer UMC has two blood drives each year for the American Red Cross. The first one is usually in January, and organized in memory of Leo McRary, one of our former members. During the cold weather, we serve hot homemade soup and toasted cheese to the donors. In the summer, we have another blood drive. Spaghetti and salad is served at that one. Our blood drives are usually well-attended, because we treat the donors well and feed them the best food we can make as a way of saying thanks for providing the gift of life to those in need of blood transfusions. Kairos is an international and ecumenical ministry designed to provide an opportunity for federal and state penitentiary residents to experience the love of Christ. The purpose of Kairos is to establish strong Christian communities among the populations of correctional institutions. This is done through the impact of small, 3-to-5 person share and prayer groups of leaders resident in the institutions. These groups are to meet weekly to share their lives on a deep spiritual level and to pray for one another, for other residents and staff in the institutions. Kairos volunteers experience a renewal of their own faith through focusing on small group dynamics, praying with one another and sharing their faith with one another during the three day mission. We ask that you pray for this ministry. Our church members stepped up and gave $308 to help pay for meals at the Alexander Correctional Facility Kairos event on February 17-20, 2011. Some of our youth and children have created placemats for the prison participants also. We thank everyone who has reached out to these men with the love of Christ. Please remember to pray during each Kairos event and throughout the year for the men who will be going in to witness about Christ, as well as the men to whom they will be sharing the gospel message of hope and love. Please see the March 2011 Newsletter for a report from Eric on the 2011 KAIROS event. Ebenezer helps support the South Caldwell Christian Ministries (828-396-4000) by collecting non-perishable food items and donated clothing, such as coats for school children, and materials for school bags several times a year. We also give money to this ministry. Some other things we do include helping people with repairs to their homes, or to add entrance ramps for those who find it difficult to negotiate stairs now. Ebenezer has been involved in several IMPACT events in Caldwell County through the Western North Carolina Conference of the United Methodist Church. The Methodist churches of Caldwell County called for volunteers from within the churches and from without in 2011 to help us buy and pack food boxes that were then shipped to places, such as Haiti, to people in need of good, safe, nutritious meals. We packed 40,176 meals and then feasted on hamburgers and hotdogs at the end of the project. We are grateful to everyone who participated in this effort. Please pray for us as we continue with other projects that will help us to develop and expand cooperation between our churches and within our communities as we share the love of Christ here and around the world. Another IMPACT event that Ebenezer helped with was building a Habitat for Humanity house in southern Caldwell County. We gave over $2500 to this project, provided many volunteers to help with the work, delivered a Saturday meal of spaghetti and cake, plus provided snacks for the workers to eat between meals. The house was dedicated on Palm Sunday afternoon, and a covered-dish meal was shared by the people who came for this special celebration. Jeremy Price and his daughter, Kassidy, expressed their gratitude to all those who helped provide this home for them through their efforts, prayer and giving. In the fall of 2012, work began on another Habitat for Humanity home, which we raised money for, and provided volunteer workers for labor. We continued to build a house a year. The latest project was completed in June 2017. Caldwell United is a group of representatives from the United Methodist churches in our county that is helping to coordinate and inspire greater cooperation among the these churches on mission and ministry projects. A Caldwell United gathering was held at Ebenezer in 2015 to help promote this effort to magnify our impact within this county. Pictures and a report are here. There will be more cooperative efforts for local missions work with the Methodist Churches of Caldwell County in the future. Thank you again for helping us with the previous projects. Please check our News page for information about current and upcoming projects. Please note that as of March 2016, the Biscuit Sales are now conducted for our Area Response Team, ART Fund, and sponsored and conducted by the Ebenezer Rainbow Sunday School Class. We have no plans to go to Costa Rica in 2017. We will continue to take orders from area businessess, etc. and deliver orders of 10 or more biscuits. You can also eat-in on the day of the fundraiser. 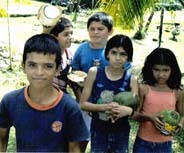 Members of Ebenezer UMC and other churches went to Costa Rica every January for a two week mission trip for about 8 years. The team members helped build churches and retreat housing. We raised funds for this mission trip with monthly ham biscuit sales that also included egg, sausage, and jelly biscuits, and gravy biscuits. The breakfast biscuit sale continues for the Area Response Team ministry, and usually occurs on the third or fourth Thursday morning of the month. We deliver orders of ten or more biscuits to area businesses, schools (teachers), and factories. We also sell biscuits directly to customers at the church, but you have to get there early or call ahead to make sure you get one. They go fast! Occasionally, we will have other full meals to raise money, such as a fish fry (for donations) or a barbecue. Visit our News page to find out about meals and other fundraisers. Some of our youth traveled to the Bowery Mission in New York for several years to help out at the mission for men who are trying to leave their former drug and alcohol dependent lives behind. Blessings abounded for the young people who went on these trips, and for the men that they served while at the Bowery Mission. They also had a chance to see the big city and take a side trip to Washington, D. C.
For several years in November and December, Ebenezer’s members generously gave items and prepared shoe boxes to send to needy children throughout the world in cooperation with Samaritan’s Purse. Sunday school classes would get together to make up boxes, along with individuals and families who prepared their own boxes. 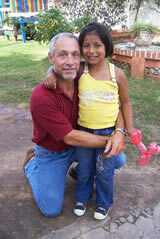 Former Pastor Eric Lane went to Bolivia for several years to help build homes for impoverished people there. In 2010, Ebenezer’s members, and friends of Ebenezer and Eric raised over $3,225 to build a home in memory of Eric’s father, R. Alvin Lane, who passed to glory in the spring of 2010. Eric had a heart for missions, though he believed that he also was called to preach and teach in the U. S. But during one of his trips to Bolivia, Eric visited an orphanage. He was overwhelmed by the needs of the children and ended up adopting one of the children. The little girl had to remain in Bolivia, but Eric payed for her care; and during his visits to Bolivia, he would take his daughter, Zulma, out to eat, give her presents, and spend time with her, showing her the love of Christ. Eric continueg to return to Bolivia each summer for several years until he was reassigned to a different church in 2016. Another member of our church, Kim Ellis, went to Bolivia in 2017. If she plans to return another year, we will let you know, and call for donations to help with the next project. In 2011, we collected $3,890.65 for the house project in Bolivia that year. This was more than enough to pay for our portion of the house, even though the cost had risen to $3800. Thank you! The extra money was used to buy more supplies or for Bibles for the Bolivians. That same year, the Pairs and Spares Sunday lunch fundraiser helped the class raise $800 to go into the trip expenses funds. The UMW's effort raised about $600 to help Eric and his family and other mission team members pay their trip expenses to go to Bolivia. We thank you for supporting our mission efforts.